Management succeeded at building up investors' excitement about the company's future at two healthcare conferences during the month, which caused shares to rally. 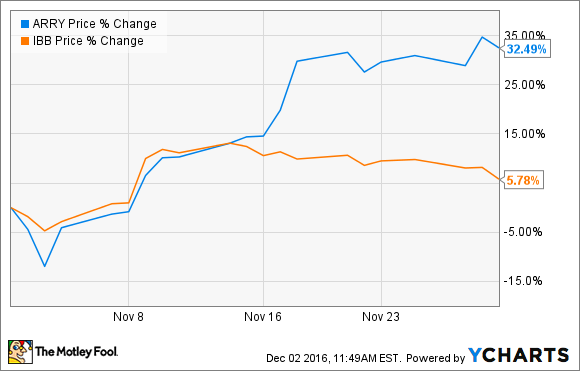 November was yet another profitable month to be an investor in Array BioPharma (NASDAQ:ARRY). Shares of the cancer-focused clinical-stage biopharma gained more than 32% during the period, according to data from S&P Global Market Intelligence. The company vastly outperformed the biotech sector in general, as measured by the iShares Nasdaq Biotechnology ETF (NASDAQ: IBB). While Array did report results from its fiscal first quarter during November, the release did not appear to be related to the stock's bullish move. In fact, Array's shares actually declined slightly in the days following the report. That makes sense, given that the company's quarterly net loss came to $0.20 per share, which was a bit worse than the $0.16 loss that Wall Street had expected. On the plus side, Array continues to receive a substantial amount of funding for its clinical trials from its former partner Novartis. That total came in at more than $31 million, which was greatly helpful in offsetting the company's rising costs. Instead, Array's huge jump looks to be attributable to the company's attendance at two different healthcare conferences in November. Management clearly did a great job of laying out the bull case for owning the company's stock at the meetings, as shares took off soon after. That bullishness makes sense in light of the company's recent clinical updates. As a reminder, Array and its partner Pierre Fabre announced very strong results from part 1 of their two-part phase 3 COLUMBUS trial in September. The COLUMBUS trial was evaluating two of Array's most advanced product candidates -- encorafenib and binimetinib -- as a combination therapy in treating patients with BRAF-mutant melanoma, a deadly form of skin cancer. Data from the trial showed that the combination therapy caused progression-free survival rates to more than double when compared with using Roche's Zelboraf alone. Beyond the great clinical results, Array also recently succeeded at having its first product accepted for regulatory review. The FDA is currently evaluating the potential approval of binimetinib as a monotherapy in treating patients with advanced NRAS-mutant melanoma. In addition, binimetinib was also submitted for regulatory review in Europe by Array's partner Pierre Fabre. That gives the company two chances at regulatory success in 2017. Given the string of positive developments, it's no surprise that investors are feeling bullish about this company's prospects. Overall, 2017 is shaping up to be a transformative year for Array. In addition to the potential approval of binimetinib as a monotherapy, Array has announced its intentions to submit binimetinib and encorafenib for review if data from part 2 of the COLUMBUS trial looks good. That's a big deal, as Roche's Zelboraf is currently pulling in more than $200 million in annualized sales. That could be a big enough market potential to finally swing Array into the black. Of course, regulatory success is never a guarantee, so I still see plenty of reasons to remain cautious.